The talented Linda Tillery has had a highly successful career as a singer/percussionist, and latterly as a cultural historian exploring the African heritage in the US. 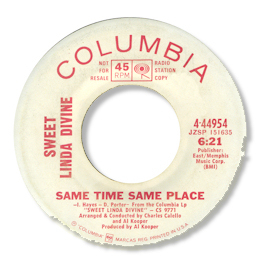 Most of her time has been spent well away from the soul mainstream, in rock orientated music and jazz, but in her first name project as “Sweet Linda Divine” she recorded a superbly soulful version of Same Time Same Place, a song best known as a Mable John original for Stax. The full blown arrangement by Al Kooper and Charlie Calello – just check out those swirling strings – make a dramatic backdrop for Linda to do her stuff. And she really delivers, hitting deep and hard in a way I’ve not heard from her anywhere else. The rap in the middle sounds very personal to me and the way she cuts loose after it is pretty sensational. Of course it does help having a number by Hayes and Porter to work around. Note ~ Only Sweet Linda Divine discs included.